IBPS SO 2019 will be conducted through a three phase (Prelims, Mains & Interview) selection process. Candidates who qualify both the rounds will be further considered for the final interview process. IBPS SO 2019 Notification will be released by Institute of Banking Personnel Selection Committee. 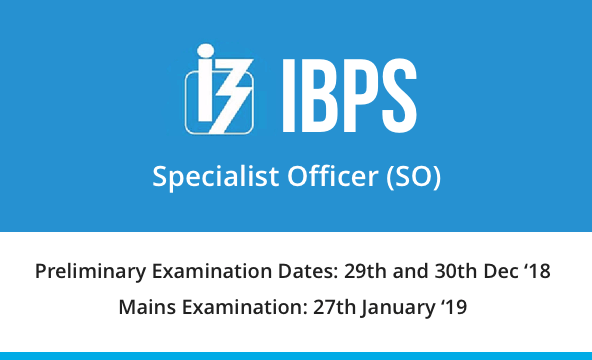 The IBPS SO recruitment 2019 is for selecting candidates for the post of Specialist Officers in different Public Sector Banks for multiple positions. Candidates selected through IBPS SO 2019 exam can be posted anywhere in India. IBPS SO Preliminary exam 2019 is scheduled on 28th and 29th December 2019. The Mains examination will be conducted on 25th January 2020. IBPS will activate the online applicable link for IBPS SO 2019 soon. Candidates are required to click on the link mentioned below to apply for IBPS SO 2019 Exam. IBPS declared around 1590+ vacancies for IBPS SO 2018 exam. This year we are expective similar number of vacancies for various posts of Specialist Officers. Only a handful of vacancies are available for this post as the post of SO involves really skilled and specialized officers excelling in their respective domain. Let's have a look at the post wise total number of vacancies for IBPS SO 2018-19 Exam to get a clear idea of the upcoming IBPS SO 2019 Vacancy. A candidate must qualify both preliminary exam and mains exam to proceed to the interview round. The candidates selected after the interview round are given the appointment letter. A candidate is required to pay Rs. 600/- (General and OBC) as his/her application fee for IBPS SO 2019 exam. The same amount is narrowed down to Rs. 100/- for candidates belonging to SC/ST/PWD category. The Online Application will start once the notification has been released by IBPS. IBPS has released new exam pattern for IBPS SO 2019 Exam. Now IBPS introduced separate sectional timing for each sections in preliminary exam. Let's have a look at the same. The preliminary exam will be a qualifying phase for the mains and candidates will have to meet the cut-offs of prelims to be eligible to appear for Mains exam. The IBPS SO eligibility criteria is different for recruiting candidates to different positions for which the candidates are selected through IBPS SO 2019 Exam. There are three parameters (citizenship, age limit and educational qualification) that a candidateneeds to fulfill to be eligible for IBPS SO 2019 Exam. IBPS SO recruits candidates for various posts like that of I.T. Officer, Agricultural Field Officer, Rajbhasha Adhikari, Law Officer, HR/Personnel Officer, Marketing Officer etc. The educational qualification is different for all these different posts. IBPS SO 2019 Syllabus is designed separately for Rajsabha Adhikari and Other Specialist Officers. The IBPS Specialist Officer syllabus is designed separately for Preliminary Exam and Mains Exam. It is necessary for all the candidates applying for IBPS SO 2019 Exam to once go through the syllabus as mentioned in the IBPS SO 2019 notification released by IBPS to prepare judiciously for this exam. Apart from the major three sections of English Language, Quantitative Aptitude and Reasoning,a candidate is required to be fluent in his/her area of expertise or the Specialization Subjects. The IBPS SO 2019 admit card will be released once the application process for the same is complete. Admit card for Preliminary Exam will be released first followed by the admit card for Mains Exam. The admit card for Mains Exam will be issued to candidates who have qualified the preliminary test. The IBPS SO Result 2019 will be released after each phase of the exam has been completed. A cumulative score of the preliminary exam, mains exam and the interview process is considered to prepare the final merit list of selected students. The merit list is prepared in the descending order of marks obtained by candidates. Candidates who make it to the merit list will be given the appointment letter by the Bank of Candidate’s choice. The IBPS SO Cut Off 2019 will be released after each phase of examination has been conducted. The cut off for the IBPS SO preliminary exam will be released first followed by cut off for mains exam. Candidates can evaluate their selection chances by matching their score with the cut off marks released by IBPS for IBPS SO Exam. Keeping in mind the IBPS SO 2019 exams, we are launching various Test Series (PRE+MAINS), Classroom Programs and Seminars to guide you through your preparations.